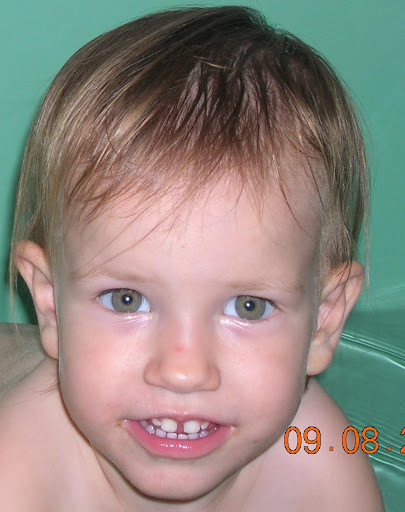 I had to get a shot of Mary before those last two top teeth come in. She has a cute gap up there, but her canines have erupted. The gap will be closing soon. Her eyes are looking pretty green here. This is the final product of those “Army guy” cookies. 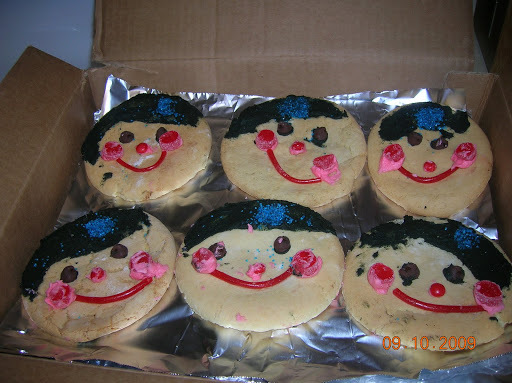 I realized when I boxed them that I had not decorated a single cookie. Some were obviously decorated by a four year old. They are all cute. 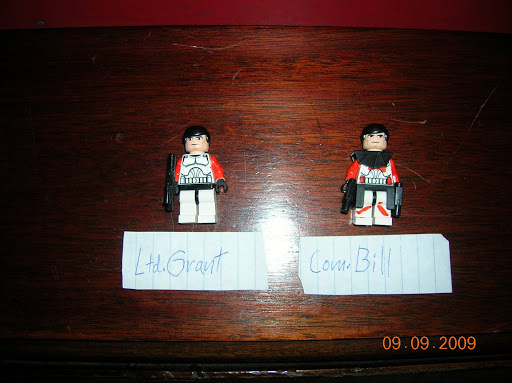 Not satisfied with plain white clone troopers, Billy took magic marker and customized these guys. I have more of his artwork that I must scan and post. He is hysterical. Maybe he’ll make comic books some day. Bill’s brother came down last weekend and right after he walked in the door, he said, “First of all, do you have any chores for me?” Need I say that he has leaped into first place on my favorite people list for this month? Here he is, reading to all the kids. He also took my van in to get a new tire – a four hour ordeal. Thank goodness it wasn’t I and six kids sitting there. He’s a good guy, and I’m very grateful for his help. This entry was posted in billy, home life, Mary. Bookmark the permalink. Is that Llama Llama I see on the couch?! Did you know there's a new one out? I'm also excited that you had your brother-in-law come by to help out. What a great guy. Hmmmmm… how old is he and how would he feel about visiting Alabama? I've got a really cute SIL to tell you about! My best friend (single, 34yo, a nurse, devout Catholic) lives in Idaho. It's the central area and beautiful. There's even a convent in our town (Cottonwood). Thanks for the kind words. It was my pleasure. At least I got to read a lot of the book while waiting for the van. : ) See you in a few weeks. Uh, if that guy doesn't get at least ONE good date out of this blog post? I'll eat my hat. 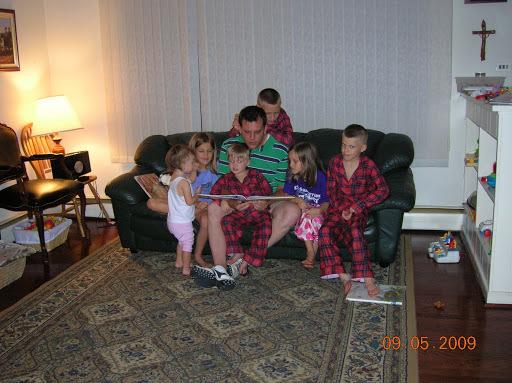 Hubba hubba, is there anything hotter than that picture of him with the kids on the couch? You should bring her to the Oktoberfest. He tells me he'll be here.